The Happy Eats card is the gift that will have them jumping for joy! 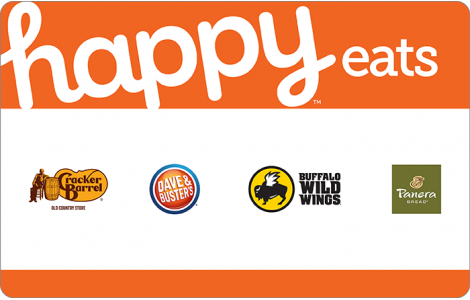 What is the Happy Eats card? It's the gift of food AND fun! Enjoy classic Southern meals while shopping for funky finds at Cracker Barrel Old Country Store. Try chicken and waffle sliders while shooting hoops at Dave & Buster’s. Share wings and a brew while cheering on the team at Buffalo Wild Wings. Or laugh with friends over a fresh salad and sandwich at Panera Bread. For anyone who loves the experience of dining out, the Happy Eats card is the perfect gift!